The book's quite inspiring. Very few books on programming make me want to actually program something. XMPP is the new black. 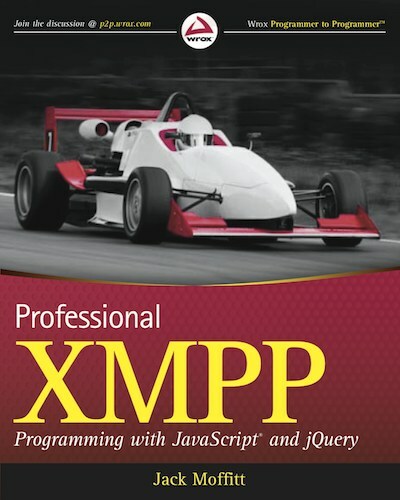 The book explains the XMPP protocol and its many uses as well as what types of problems it solves best. Nine applications are developed in increasing complexity, starting with an XMPP-based “Hello, World” example and ending with a real-time, multi-user gaming system for Tic-Tac-Toe. Jack Moffitt is a hacker and entrepreneur based in Albuquerque, New Mexico. He has founded several startups built on XMPP technology including Chesspark, a real-time, multi-user gaming platform, and Collecta, a real-time search engine for the Web. He has started and contributed to numerous XMPP related open source and free software projects including the Strophe XMPP client libraries, the Punjab XMPP connection manager, the Palaver multi-user chat component, the Speeqe group chat application. He also has served several terms on both the XSF Board of Directors and the XSF Council. Previous to his XMPP work, he created the Icecast streaming media server, managed the Ogg, Vorbis, and Theora codec projects, and co-founded the Xiph.org Foundation, a standards organization for royalty-free multimedia technologies for the Internet.